The section starts with an Order Wine button. This whole section needs to move down to accommodate an addition to the main menu. Image attached I would also like to move down the cross visual to the right of the menu. Do you still need any help with it? Ahh yes sorry i removed the offending menu link. it is back live again and it should match the image that was attached. 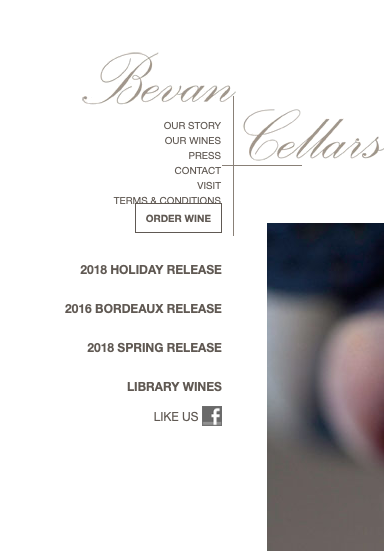 You can add more space above the 'Order Wine' button and right section + match the right cross by adding the following code to the Customizer > Additional CSS box. perfect! do you have code to move the cross image down as needed also? If I misunderstood please can you explain a little more so that I can understand properly and help you accordingly? The horizontal part of the cross image should line up with the bottom of the Terms and Conditions menu item to get it back in the right spot. Okay, replace the complete code with the following code. ahh now i see, i just adjusted the height and it works perfectly. thanks much again!